Recently my mother-in-law died and our lives took a brand new turn. Someone recommended that I read this book. (I can't remember who.) They said I might want to wait awhile to read it given the emotions that it could possibly invoke. It just so happened that this was on my TBR list, having picked it up recently at the Friends of the Library book sale. I know I'm way behind the times in reading it, but since it was once "all the rage" I avoided it. (I tend to avoid rages.) However, this morning I found myself with a little time and decided to give it a go. I was thinking that I'd have to have tissues or something handy but I was rather surprised. So. I know this book is touted to be a real tear-jerker-rock-your-world type of book. It's supposed to make you think about how short life is and its supposed to make you want to live each day to the fullest. I suppose it does that, provided you've never once thought about death before in your life. To me, death is an inevitable part of life and I've thought about it before. This book tells the story of the final days of Morrie Schwartz, a professor at Brandeis University. He discovered that he had Lou Gehrig's Disease and was suddenly faced with the prospect of a rather imminent death. 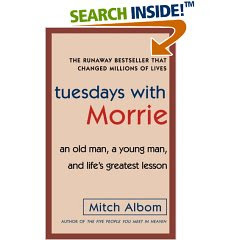 He tells his story of how he had decided to face death to one of his former and beloved pupils, Mitch Albom, who relays the message onto all of us. I suppose if you aren't a Christian and have never thought much about life and death before, this book would be insightful. I have to confess I've debated back and forth at how to review this book. On the one hand, this book seemed to be about a kindly well-intentioned old man who wished to pass along a message of inspiration to a younger generation. He decided to meet death head on by living each day to its fullest. On the other hand, Mr. Schwartz was not, by profession of this book, a Christian. Albom clearly states that Schwartz was a "religious mutt" who welcomed various "truths" from a variety of religions. He was a man who, in essence, picked his fancy. Whatever sounded good, insightful and peaceful was something that Schwartz would latch onto. However, without Christ there is no peace. When viewed in a Godless light - Mr. Schwartz really offered the world......nothing. John 14:6 "Jesus answered, "I am the way and the truth and the life. No one comes to the Father except through me." There simply are no other ways. The way is straight, narrow and rather exacting. It is lacking nothing; there is no other truth. Without Christ as Mr. Schwartz center, he had no hope to offer. Love others, be a good person, and you will die in peace and exist in a future (unknown) peace. But that simply is not truth. We are all born in sin and conceived in it. The wages of sin is death. We are all doomed to an eternity in hell barring the saving grace of the Lord Jesus Christ. Without this grace, we are lost. With it we are saved for all eternity. What is man's purpose on this earth? Not to love other men (although that is a calling as a Christian) but it is to glorify God and to enjoy Him forever. It is only because God loved me first that I am remotely able to turn around and bestow any love on anyone else. I repeat: I am not able to love without the love of God. Not satisfactorily (although I may experience warm fuzzies). Although some may view this book as encouragement and inspiration during a time of great trial or the loss of a loved one...I didn't find it so. You see, I am assured of my MIL's eternal salvation. I know her joy exceeds my own. I know I have much to look forward to and I have nothing to be mad about in her enjoying the very same thing right now. I feel like this book does more to distract people from truth than it does in drawing them to it. Death should cause us to seek God. Death should cause us to examine our lives and turn from our sin. Death is the final call from which there is no come back. To distract the masses with motivational statements might make the public feel good in the moment but I guarantee you it will not make them feel good in eternity. Better to present truth than cover it up in an ungrounded promise of peace that no human can offer to another. The idea for this book would be good were it grounded in truth. But as it is, it is not and that is a sad thing if you stop to really think about its implications. Psalm 90:12 "Teach us to number our days aright, that we may gain a heart of wisdom." Have you confessed your sins and accepted Jesus Christ as Lord of your life? Without Him, you are lost, despite the good intentions of people like Albom and Schwartz. Good works do not save. Christ does. I'm in total agreement with your perception of the book. I took up the book after several had given rave reviews about it. I was sadden by the story. Here was yet another, no doubt very nice man in his way,who passed into eternity without the knowledge of who Christ is. A man who left this earth with no hope...nor was he able to impart any to his student. May we, as Bible-believeing Christians, be faithful to speak the Truth in season and out. into the lives of His people and make life meaningful and worthwhile, if we seek Him. That last verse is one of my recent favorites. I also didn't think that it was all that great. I think that your take on it is right on target. I picked it up for saturday review challenge from your reviewed list. I had not read your review till today. Do check mine by clicking on my name. Thanks for this Claire. I couldn't agree more! I agree that many of the ideas in the book are good and true, but as a Christian, this book is not as full of goodness and truth as the Bible! And as you say, it omits, and in fact creates confusion about, the ultimate most crucial truth of all - the importance of recognising Jesus for who He is. A non-Christian friend lent me the book and your post has helped me to put into words my response to her. What a blessing to find an honest book review that stands for knowing TRUTH. This book is on summer reading list for my 14yo daughter. I appreciate your boldness in Christ. Thank you for standing for truth and for sharing Christ. I realize that this book creates an opportunity to discuss one's purpose in life. Would you recommend a 14yo to read this book? The other choices are The Giver, by Lois Lowry or 7 Habits of Highly Effective Teens by Sean Covey. Sheila - I can't think of anything objectionable that would keep me from wanting to hand this book over to a 14 year old. As I still have The Giver on MY TBR list - I can't speak to that! It's not right the way you threaten people with hellfire. I'm well behind the times reading this as well, but after reading it I had to reflect a little bit. Being such a highly touted book, I was surprised that I didn't like it very much, but I knew why I found it just a little bit "off". When I went searching for other reviews, I found yours and it was exactly what I was looking for. I just wanted to say you hit it right on. Thanks for writing this!